I’ve been having a blast drawing my first Where’s Waldo?-type illustration. While there are plenty of things to find, I wanted to share with you a little bit about how much fun this was to color. I packed each major stage of the coloring process into this animated gif, so you can see how it all came together, bit by bit, just the way I colored it. 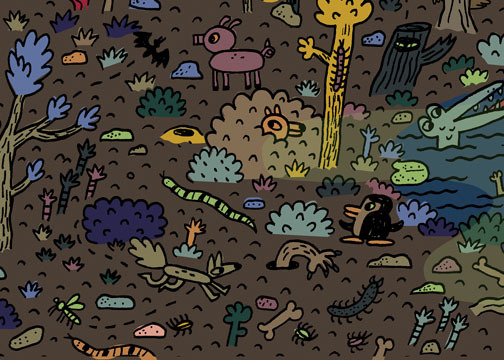 Click on the drawing below to watch the haunted swamp come to life! If you like this, you’ll definitely want to stay tuned for what’s next! I’m working on a project that is going to need your help, and will be something worth watching for (I hope!). coloring processdigital coloringdrawing processjess smart smileylook and findpicture puzzlesmiley artwhere's waldo? Took awhile but I found him. Now I just have to get people to believe me! 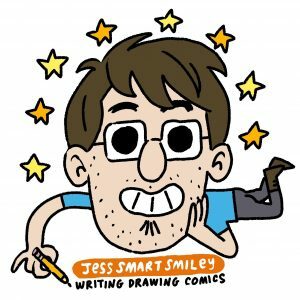 Jess – I really dig the animation you put together to show your technique. Thanks! Sweet. I’ll keep that in mind for my next Look-N-Find drawing.